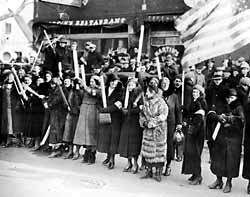 For a terse telling of the Flint sit-down strike story, click this link: Flint Workers Sat Down and U.S. Middle Class Rose Up. 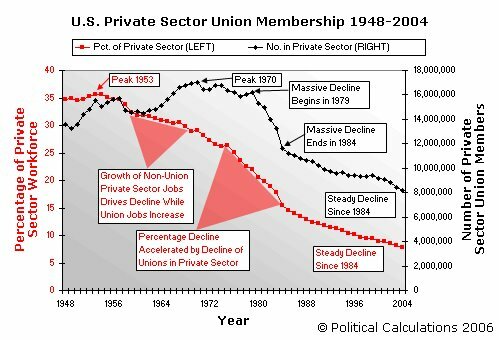 Sources: Union Sourcebook 1947-1983; U.S. Bureau of Labor Statistics. Compiled by Labor Research Association. Update: The Bureau of Labor Statistics answers the claims from the next note that it has understated inflation. In the early 1990s, press reports began surfacing as to how the CPI really was significantly overstating inflation. If only the CPI inflation rate could be reduced, it was argued, then entitlements, such as social security, would not increase as much each year, and that would help to bring the budget deficit under control. Behind this movement were financial luminaries Michael Boskin, then chief economist to the first Bush Administration, and Alan Greenspan, Chairman of the Board of Governors of the Federal Reserve System. Up until the Boskin/Greenspan agendum surfaced, the CPI was measured using the costs of a fixed basket of goods, a fairly simple and straightforward concept. The identical basket of goods would be priced at prevailing market costs for each period, and the period-to-period change in the cost of that market basket represented the rate of inflation in terms of maintaining a constant standard of living. Aside from the changed weighting, the average person also tends to sense higher inflation than is reported by the BLS, because of hedonics, as in hedonism. Hedonics adjusts the prices of goods for the increased pleasure the consumer derives from them. That new washing machine you bought did not cost you 20% more than it would have cost you last year, because you got an offsetting 20% increase in the pleasure you derive from pushing its new electronic control buttons instead of turning that old noisy dial, according to the BLS.